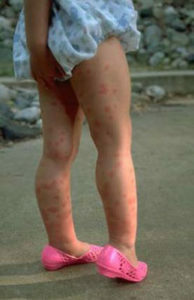 Have you encountered Swimmer’s Itch, this year? Have members of your family, your guests, or your neighbors? Please help us identify where the problem exists and how bad it is. The Three Lakes Association (TLA) has a reporting tool for the public, accessible here on our website. This is free of charge, and does not require any kind of registration, ID, or password. It can be used as often as needed to record as many occurrences as you wish report. You can report cases that occurred anytime over the summer. The responses will be summarized in a report that outlines the magnitude of the problem, and the report will be forwarded to the MDEQ, the state organization responsible for corrective action. The reporting tool will remain available until the end of October 2018.